Did you know that chickens can’t sweat? Instead, chickens use their legs, combs and wattles to lead heat away from their bodies. They also pant and spread their wings in order to get some air through those feathers. Chickens also enjoy lying down in the shade when it’s very hot, and of course they drink lots of water. Did you know that it is actually easier for chickens to keep themselves warm in winter than it is for them to cool down during the summer? 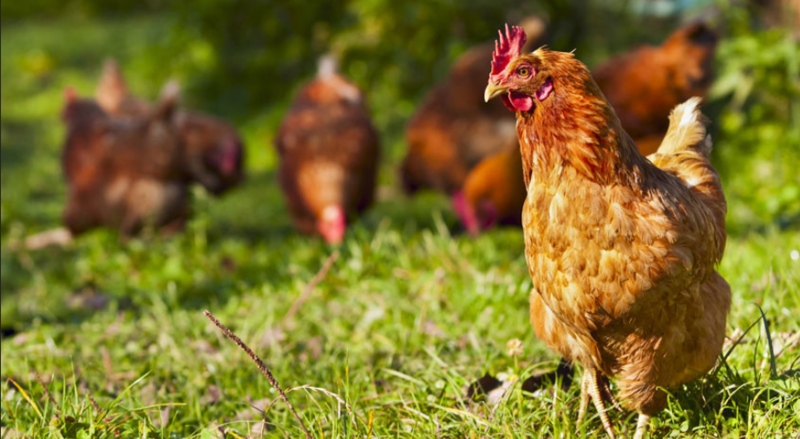 It isn’t just an issue of comfort either – chickens can die of heatstroke. Since chickens have a hard time cooling themselves down, when it gets extremely hot they rely on you to help them. So, what can you do to help your chickens keep cool in the summer heat? Eggs consist mainly of water, so producing an egg absorbs a lot of water from a hen’s body. Drinking cool water is also one of the main ways in which chickens cool themselves down. Your chickens will therefore need lots of fresh, clean and cool water in the heat of the summer. It’s best to change the water every day to make sure they have this. 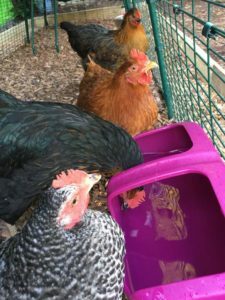 It is also a good idea to provide several water sources so all your chickens can drink at the same time and don’t have to fight for access and end up dehydrating. Another way you can use water to help your chickens cool down is by providing some shallow pools where they can dip and cool their feet and legs, remember that this is one of the areas where heat leaves their bodies. Try filling some shallow bowls or tubs and leaving them around in the run or your garden. If your chickens don’t like to stand directly in the water you can try placing a brick in there which will be cooled by the water and which the chickens can then stand on top of. It is absolutely essential to provide shade for your chickens and even more so when it gets really hot. If you let your chickens free-range in the garden they might be able to find shade under trees and bushes but in any case it is a good idea to provide shade in the run as well. You can easily create shady spots in the run for instance by having a raised coop and/or attaching covers to the run. Try giving you hens some cool treats such as frozen berries, vegetables or pieces of fruit. You could even create hanging treats by freezing your chickens’ favourite treats in an ice cube tray with a string in the middle so they can hang in the run. Or try keeping a whole watermelon in the fridge to cool it down before serving as a summery treat. Be careful not to give your chickens too many treat though, as you want to make sure they eat their layers pellets. Chickens eat less when it’s extremely hot because digestion produces more body heat, so it’s important to make sure they eat the right things and get the vitamins and minerals they need. 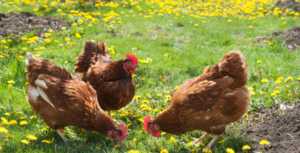 Try feeding your chickens during the cooler parts of the day such as in the evening. See tip #4 as well. 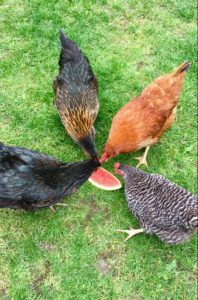 It is a good idea to give your hens some nutritional supplements in the heat such as vitamins and tonics which can be added directly to their food or water. These can improve absorption of minerals, give your chickens a boost to improve their overall health and help them cope better with the heat. Apple cider vinegar, for instance, can help with calcium absorption in the body which is essential for egg shell production. 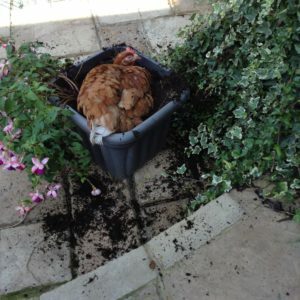 Chickens love to dust bathe in the warm weather, but you might not want them scraping around in your flower beds. The best thing to do is to build another flower bed (but not for your flowers) and fill it with some sand, soil and some louse powder. If you have a large flock you might even want to provide several spaces so all your chickens have a chance to dust bathe in the shade. Make sure that you place the dust bath in a sheltered spot or cover it up when your chickens aren’t using it otherwise the rain might turn it into a mud bath. 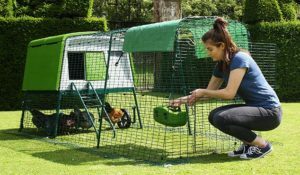 Your chickens will need plenty of space during the hot summer months so make sure they aren’t overcrowded. It will be even hotter for them if they are crowded too closely together. Chickens need to be able to spread out and spread their wings for ventilation, and everyone in the flock needs to be able to drink cool water and lie in the shade at any time. All Omlet Eglu chicken coops have a unique twin-wall insulation system which works in a similar way to double glazing. This means they do not overheat in the summer. They are also built with a draught-free ventilation system, carefully designed to avoid air blowing directly over the roosting area whilst allowing fresh air to circulate. If you have a wooden chicken coop, it is important to think about how you can keep the coop nice and cool for your chickens. Make sure you create plenty of ventilation either by opening windows in the coop or by using a fan. Be careful not to have too much thick and heavy bedding as it absorbs heat. Also keep an eye out for mould if you’ve got a wooden coop. Mould can make straw and hay start to rot faster, thereby producing more heat, so make sure you clean out the coop regularly and especially at any signs of mould. If your chickens are reluctant to go into the hot coop during the day to lay their eggs you could try providing nesting boxes for them outside in cooler, shaded areas. We wish you and your chickens a lovely summer!